Five-time Formula One (F1) world champion Lewis Hamilton has sampled a Pata Yamaha WorldSBK-spec YZF-R1 in a private test hosted at the weekend in Jerez, Spain. 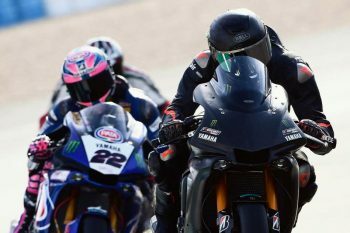 According to Italian media outlet Gazzetta dello Sport, the Mercedes AMG Petronas driver escaped uninjured from a fall while taking to the track alongside factory riders Alex Lowes and Michael van der Mark. It’s understood the British ace was one of many riders to hit the circuit that most recently hosted testing for both MotoGP and WorldSBK, and despite the crash, he later returned to riding aboard another available machine. Hamilton has a long association with motorcycles and is a current ambassador for MV Agusta, the Italian manufacturer recognising the multi-time world champion with a special edition Brutale 800 RR LH44 motorcycle.